Paris attacks: Who was Hasna Ait Boulahcen? French prosecutors have confirmed that Hasna Ait Boulahcen, 26, was the woman who died when she blew herself up during a police raid on a flat in the Paris suburb of Saint-Denis on Wednesday. The operation targeted the suspected ringleader of the Paris attacks, Abdelhamid Abaaoud. The BBC's Tom Burridge met people who knew her. 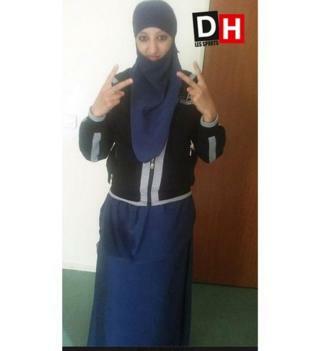 Hasna Ait Boulahcen's mother reportedly lived in a large block of flats in the Paris suburb of Aulnay-sous-Bois. There were heavily armed masked police there on Thursday evening. We met two women who knew her. Khemissa, who went to school with her, says the Hasna she knew "loved life", but describes her former classmate as "vulnerable" and "fragile". "I don't think she had the intention to be a suicide bomber," she says. "I don't think she planned it, it must have been a last-minute thing - she was influenced." Media captionKhemissa: "I don't think [Hasna Ait Boulahcen] had the intention to be a suicide bomber. She was influenced. She was vulnerable." She was aware of reports that Hasna Ait Boulahcen had written on Facebook that she wanted to travel to Syria. "We didn't really believe her. We thought it was words without meaning." Was she religious, we ask? "She was maybe brain-washed, or influenced. She was a weak person. They came at the right moment. They found the right person," she says. Given the ruthless, unmitigated violence in Paris a week ago, suggestions that Hasna Ait Boulahcen was a victim will understandably be met with anger. However, another woman who said she knew Hasna Ait Boulahcen "very well" also said she couldn't believe "that she was a terrorist". The woman, who didn't want to give her name, confirmed Khemissa's assertion that Ait Boulahcen had spent time in the care of social services. She said her father had left her mother and siblings. "There were problems in the family," she said. The woman said Hasna Ait Boulahcen's mother sometimes looked after her children. Hasna "had a sad childhood," she said. "But I would never have thought the girl would have done that. She was always smiling and very polite." As we spoke to the women, crowds of teenagers and young men, clearly with little to do, hung around. Some of them shouted mockingly at the armed policemen in balaclavas as they drove away. One policeman gave them a two-fingered victory salute out of the window. Aulnay-sous-Bois, a suburb to northeast of the French capital, has deep social problems. There was violence here during the 2005 Paris riots. Other reports of Ait Boulahcen in British newspapers paint a picture of a party girl. Khemissa, who told us she took dance classes with Hasna, says she got good grades. "I don't think she was in a normal state," she says. "I think she must have been drugged. She must have taken substances. She was not in a normal state, otherwise she wouldn't have done that." Paris attacks: Who was Abdelhamid Abaaoud?